Dickens, Charles (1812-1870) Autograph Note Signed, 6 June 1854. Single sheet of light blue laid paper, inscribed on one side in blue ink. To an unnamed recipient, with the following message, "I suppose the mistake to which your note refers, to have occurred in Mr. Wills's p---. My proofs are correct, except that I have two of them. 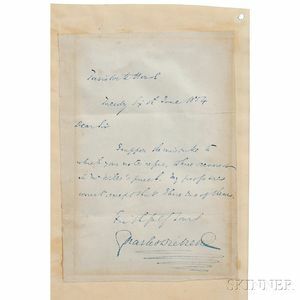 Faithfully yours, Charles Dickens"; with a portrait, marginal mat burn on the margins of the letter, which is mounted on a sheet and backed with an unidentified letter from 1865, 6 1/4 x 4 1/4 in.